- Yesterday, the United States Supreme Court upheld a ban on the grotesque practice of partial-birth abortions. If you're not sure what it is, I'm not going to describe it for you, but suffice it to say that one of my American heroes, the late Sen. Daniel Patrick Moynihan (D-NY) who also, by the way, happens to be Hillary Clinton's predecessor, once referred to it as "infanticide". Even if you're an ardent pro-choicer or take a position that's more along the lines of the moderate, Clintonesque "safe, legal and rare" perspective, if you've held a baby who is less than 24 hours old in your arms as I have had the privilege of doing (a shout-out to my nephew Loulou right there), you can't help but be against partial birth abortion. At the risk of being called "anti-woman", I'll point out that there's no law against this in Canada. Anyone expect our so-called conservative PM, fresh off a love-in for Brian Mulroney last night, to even touch it during the upcoming election campaign? - By the way, isn't it a little bit rich for Preston Manning to be selling his name and attaching it to a course in policy implementation considering the guy has never signed a bill into law? - In a recent interview with Maclean's, former separatist premier of Quebec, Bernard Landry, said that "the PQ has never been about ethnic nationalism. Never. The PQ’s mission - since René Lévesque - has never been an ethnic one. It’s a national quest and the Quebec nation is not an ethnic one." The election, he said, had left the province pockmarked - the result of an ugly “wave of Quebec-bashing” in the English-Canadian press. And before he was willing to talk about the election, he wanted to conduct an interview of his own. Once he had established he was speaking to a Quebecker, Landry agreed to discuss the election that saw the party he once led fall to an historic low in popular support - from the impact of the debate over religious accommodations to rival parties mining the Parti Québécois’s vote. No ethnic element to the nationalist project, huh, Bern? - Stick a fork in him: John McCain started singing the Beach Boys when asked about Iran, as in "bomb, bomb, bomb, bomb, bomb Iran". - Despite a few chuckles here and there, I don't understand why people love Will Ferrell so much, especially after watching this supposedly hilarious video. Good calls on many fronts. To suggest Will Ferrell is overrated is the understatement of the year. Since Old School his movies have been positively Jim Careyesque. When Jack Black has more talent than you, you’re in serious trouble. Now that I know what it is, partial birth abortion is one of the most abhorrent procedures you can imagine. It boggles the mind that there is even debate about it. John McCain may be done now but unofficially he was finished the moment he stepped foot on Jerry Falwell's "university," and delivered a commencement speak. Will Ferrell is definately over-rated. Blades of Glory was pretty good though (MUCH better than Taladega Nights, Anchor Man) - but he's definitely spreading himself too thin. 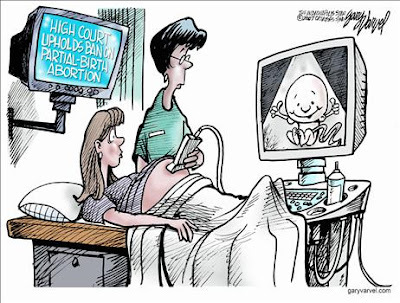 Re partial birth abortion - I ask you this - Have you truly educated yourselves on what the Supreme court rulted on? Q6. What is a "partial-birth abortion"? Is this law about "late-term" or "third- trimester" abortions? A6. The Act defines the term "partial-birth abortion" so broadly that it would prohibit a wide range of abortions performed in the second trimester. Indeed, there is no such medical term as "partial-birth abortion." Nor is this law about third-trimester abortions. Forty states and the District of Columbia already ban third-trimester abortions except when the life or health of the woman is at stake. Instead, the broad language of the law would ban abortions as early as 12 to 15 weeks, and it fails to include a health exception to protect women. Q7. When do most abortions occur? A7. The overwhelming majority of abortions are performed in the first trimester of pregnancy. The Centers for Disease Control estimates that 58 percent of legal abortions occur within the first eight weeks of gestation, and 88 percent are performed within the first 12 weeks (based on the most recent data from 2000). Just over 10 percent are performed between 13 and 20 weeks. Less than one-half-of-one percent occur after 24 weeks. Finally - as someone who used to think that John McCain was a Republican I could live with as President, the fiasco Hammer has linked to along with his comical "walking tour" in Iraq a few weeks ago and his convocation speech at Jerry Fallwell U last year, has once and for all put an end to those thoughts. What a yutz. Read Justice Kennedy's first ruling from yesterday and see for yourself how the Act in question defines partial birth abortion. It's on page 2 of the document I've linked to below. A more graphic description begins on page 11 which also suggests that most of these procedures take place during the second trimester. I would advise against reading it while eating. And as far as Farrell goes, perhaps we're just too smart for the room, boys. At the risk of being to dumb for the room, I like Farrell. Mostly because he has great timing. Like Chevy Chase circa Fletch, he has a certain deadpan delivery that can make normal lines seem funny. That being said, Talledega Nights was awful. Ferrell himself is good but he is choosing some awful scripts to work with. Lately the only funny lines in his movies, Blades of Glory included, are his. I guess absurd humour isn't for you. Larry the Cable Guy seems to be more your cup of tea. I have actually never really seen him, but thanks for the tip. As a big fan of the Jackass movies, I'm sure you're probably on to something there.